Esenwein & Johnson enjoyed the second most active architectural practice in Buffalo, New York (after Green & Wicks), at the turn of the twentieth century. The firm had offices at 775-793 Ellicott Square. The site of President McKinley's ill-fated meeting with assassin Leon Czolgosz in September 1901. Conrad Diehl, the son of a German immigrant from Wittgenbron, Hessen Kassel, was born in Buffalo in 1843. He was a physician who graduated from UB's Medical School. He was a member, then President, of the Buffalo School Board before he was elected Mayor in 1897, as a Democrat. He was also a member the Sangerbund (Singers' Association). As Mayor, Dr. Diehl played an important role in bringing the Pan-American Exposition to Buffalo. The first of eight German-American mayors, Becker was was also the first foreign-born Buffalo mayor. Philip Becker, a wealthy insurance broker to the German community (who began as a grocer), became the first German-American mayor of Buffalo in 1876. Solomon Scheu, a baker turned successful grocer, defeated Becker in his bid for a second term. Becker served again for two more terms starting in 1886. Mayor Scheu was born in Bavaria in 1822. he emigrated to new York City in 1839. In 1844, he moved to Buffalo, and two years later he opened his own bakery. In 1852 he opened a saloon, eating house and billiards room at the corner of Main & Mohawk. There he met politicians, etc. Fuhrmann Blvd. as named after this successful meat packer. Mayor Fuhrmann was born in Buffalo in 1868. In 1966 he moved to Kansas City to take charge of the wholesale dressed beef business for the Buffalo-based Jacob Dold Meat packing Co. In 1892, he started his own meat packing business at 1010 Vinton St. In 1905, he was elected a member of the Board of Aldermen for the fifth ward. Born on Smith Street in Buffalo in 1874. Opened a liquor store at Broadway and Jefferson 1912. He claimed he ran for mayor as a lark after a newspaper reporter suggested it in the newspaper. He unexpectedly won. Zimmerman became a partner in his father's lumber business. Before he was elected mayor, he served on the Buffalo Board of Education for seven years, spending much time directing the school construction program. He was the last German-American to be elected mayor. Main and Court St. Replaced by the present Liberty Bank Building in 1925. Chartered in 1882, one of five banks capitalized with German investment. The trustees changed its name to the Liberty bank after World War I in 1918. Replaced by the Tishman building. Jacob Schoellkopf epitomized a true industrialist, with interests in tanneries, banking, paper milling, hotels, flour milling, and perhaps most lasting, harnessing power from Niagara Falls and producing hydroelectricity. The Schoellkopf Generating Station eventually became part of Niagara Mohawk Power Corporation. The first member of the family born in the United States, won the respect and approbation that had hitherto been denied the city's German residents. He was admitted to the most exclusive clubs, and appointed director of two bastions of WASP control, the historical society and Buffalo General Hospital. Cornell's Schoellkopf Field was completed in 1915 with funds given by Jacob F. Schoellkopf, Jr., '05, Paul A. Schoellkopf '06, Walter H. Schoellkopf '08 and William G. Schoellkopf '19. The George Urban Milling Company produced several well-known brands of flour which were used in every part of the country. The immense new mill of the company, at Urban and Kehr streets, adjacent to the tracks of the New York Central Belt Line, was completed in 1903. This mill was the first mill in Buffalo in which the motive power was exclusively electricity, brought here from Niagara Falls. By the turn of the century, brewing had become a major industry in Buffalo. There was tough competition among the 25 breweries that operated in the city at that time. The little "mom and pop" organizations of the early to mid-eighteen hundreds could not compete with the much larger "corporations" and cooperatives that had evolved and thereby ending the first wave of micro-breweries. In 1896, Buffalo's 19 breweries produced an output of 652,340 barrels. Joe Josephs, sign painter, sometime artist, and Liedertafel singer, was one of Buffalo's authentic characters Like many of his fellow Protestant Germans in the post-Civil War era, he was also staunchly Republican. He was captain of the local rail splitting team for two Republican presidential candidates, Lincoln in 1860 and Garfield in 1880. Josephs understood the publicity stunt. His shop at the foot of Exchange St. in Buffalo was decorated top to bottom with visual word puzzles and pictures of elephants. A publicity wizard, Elephant Joe could (as the saying went) make people "see an elephant" where there was none. William Hengerer was born in Wurtemburg, Germany, in 1839. In 1895 a joint-stock company was formed, known as The William Hengerer Company. Hengerer was 52. Caption: Birthplace of the Buffalo Saengerbund. Charles Dorn's house, corner of Cherry and Maple Streets, in which this famous Buffalo singing society was organized, 1853.
several historic buildings in Nuremberg, as well as a large open-air restaurant and concert area on the Midway. Within the buildings were reproductions of artwork and other cultural treasures of Germany. For the new Buffalo parks, Calvert Vaux (Olmsted's partner) designed a number of structures. Outstanding among them was the Parade (The Parade is now known as Martin Luther King Jr. Park) House, a spectacular timber building that opened in 1876. Containing a large restaurant and smaller rooms for private parties, it became the scene in summer of public amusements that members of the large German community that lived nearby especially favored. On a special wooden floor set up outside, dancers twirled to the music of an orchestra seated overhead on a balcony while loungers on the extensive verandahs enjoyed watching the gay proceeding. St. Louis Church, Buffalo's first Roman Catholic parish (founded 1829), was also the area's largest in the decades before the Civil War. Originally multiethnic, the Church became more and more German as the Irish departed, complaining of harassment. When Bishop Timon became the first bishop of the Buffalo diocese, he fought with the German trustees over control of the church. Well-educated German Jewish immigrants settled along North, Franklin and Tupper Sts. In 1850, they organized an Orthodox congregation, Beth Zion, at Ellicott and Clinton Sts. The illustration is of the third Beth Zion temple,which was located on Delaware Avenue next door (north) to the Wilcox Mansion. Caption: First building of St. John's Church (Evangelical Lutheran), Hickory St. First German Protestant Society in Buffalo. Cornerstone laid 1835. Completed 1843. Replaced by new church, 1875. Genevieve Schoellkopf: born in Buffalo 1884, a granddaughter of "King Jacob," Jacob Frederick Schoellkopf, one of the most successful German immigrants in Western New York at the turn of the century (see above). William Dorsheimer was born on February 5, 1832 in Lyons, New York. When he was 5 his parents moved to Buffalo. When he reached school age he attended the public schools. He wanted to study jurisprudence so he attended Harvard University. After he finished his studies he was admitted to the Bar. During the Civil War he served on the staff of General J.C. Fremont. In 1869 he was appointed Federal Prosecutor of the Northern Districts of New York by Andrew Johnson. He stayed at this post until 1871. In 1874 he was elected with Samuel J. Tilden to the office of Lieutenant Governor. He was Lieutenant Governor a second time, this time running on the ticket with Lucius Robinson in 1879. After his second term he settled in New York and established a law partnership with David Dudley Field. In 1884 he took over the editorship of the New York Star. Mr. Dorsheimer was one of the principle founders of the Parks System. He died on March 26, 1888 in Savannah, Georgia. By the 1840s German-Americans made up one-third of Buffalo's population and were the largest foreign-born group in the city. Unlike the Irish, German immigrants to Buffalo settled inland from the waterfront in an East Side area known as the "Fruit Belt" because of its street names. Religion: The German immigrants, though principally Roman Catholic, embraced a variety of religious faiths. German Catholics in 1832 built St. Louis Church, originally a log structure (illustration), at Main and Edward, where its cathedral-like structure stands today. Three years later German Protestants built themselves a place of worship on Hickory Street (photo above). Along with the other religious groups from Germany came a number of well-educated Jews. These German Jews settled along North, Franklin, and Tupper streets. In 1850 they organized an Orthodox congregation, Beth Zion, at Ellicott and Clinton Streets. Later, as most German Jews in the United States joined the Reform movement, Beth Zion (now located on Delaware Avenue) became a Reform congregation. Politics: German-Americans organized for political purposes, as most ethnic groups have. All in all, eight German-Americans have served as mayors of Buffalo from Philip Becker (portrait above) Buffalo's first foreign-born mayor, in the 1870s, to George Zimmerman (portrait above) in the 19305s. German names became known in other activities besides politics. Louis Fuhrmann (portrait above) -- for whom Fuhrmann Boulevard was named -- not only was elected mayor of Buffalo but was a leading meat packer, as were such other prominent German-Americans as Christian Klinck and Jacob Dold. German immigration tapered off in the early 20th century, as Chancellor Otto von Bismarck promoted programs to keep young Germans satisfied at home, and German-American influence in Buffalo began to be diluted. Anti-German feeling during World War I also played a significant part, leading to changes in a number of street names. Though it may not have lessened the bank's influence, the directors of the German-American bank (photo above), chartered in 1882, decided to change its name to the Liberty Bank. 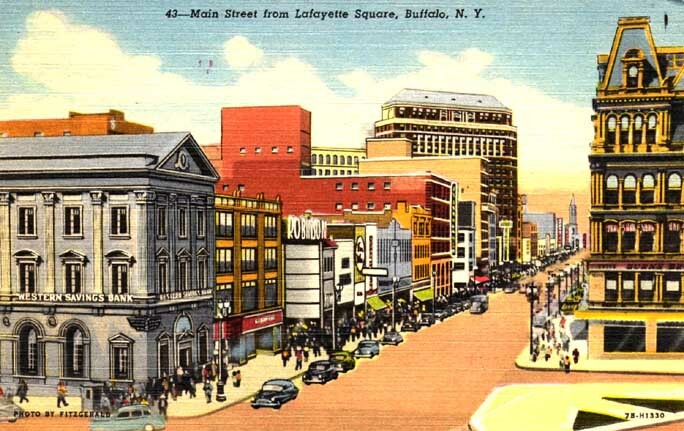 After the war, the national-origins quota system of the 1920s cut down on all immigration from Europe, and German-American influence was further reduced as descendants of the Old German wards in Buffalo moved elsewhere. The Germans came to Buffalo already skilled and most of Buffalo's skilled workers were German -- shoemakers, masons, tailors, musicians, blacksmiths, boilermakers , butchers, upholsterers, painters, tinsmiths, stonecutters, clock makers, bakers, cigar-makers -- and many of them were quite well educated. German language: The desire to perpetuate the German language was a critical element in the cultural cohesiveness of the German community. In both Catholic and Protestant German churches, sermons were delivered and scriptures were read in the native tongue. German was also the language used in the five German Catholic schools that existed in Buffalo in 1850. Indeed, many Germans insisted that their language achieve official status, demanding that Buffalo should become officially bilingual, with all laws and ordinances printed in both languages. Other groups, such as the German Young Men's Association, a cultural nationalist group founded in Buffalo in 1841, were dedicated to the perpetuation and preservation of the German language and culture. The community's struggle for public recognition of the German language and German culture continued throughout the next decade as German leaders made persistent and periodic requests for the appointment of German teachers in, schools in German neighborhoods. It was not until 1866, perhaps as a kind of guilt-ridden recognition of the role that Buffalo's German population had played in the war effort, that the Common Council finally relented and did appoint several German teachers to teach German in four schools on Buffalo's East Side. Business: What is most interesting about this first generation of German businessmen -- people like Solomon Scheu (portrait above) and Albert Ziegler. both brewers; Jacob Schoellkopf (photo above), a tanner; and Stephen Recker, a wholesale grocer -- was that they had stayed in their homeland until after they had acquired an education and a trade. Scheu, for example, had been trained as a baker before he arrived in this country in 1840 at the age of sixteen. Schoellkopf, who by the end of the l850s owned one of the largest tanneries in Buffalo, had been trained as a tanner during his youth in Germany. Albert Ziegler, whose brewery made over forty thousand barrels of beer per year and was the biggest in Buffalo, had worked as a brewer as a teenager in Wurtenburg. Thus, within ten or so years after their arrival in Buffalo (usually after a short stay in New York City), these men had become eminently successful businessmen, the object of envy and admiration not only within their own community but throughout the whole city. By 1900, the Poles had replaced Germans as the dominant ethnic group on the East Side. No longer the despised race that [Millard] Fillmore and his cohorts had railed against, Buffalo's Germans, now making up more than half of the city's population, had left their East Side enclave and assumed a major role in the life of the city. The whole fiber of the city had become German. There were five German owned banks, six German insurance companies, a German hospital, scores of German churches, several turnvereins, and the nationally known Saengerbund Singing Society. But unlike the other immigrant groups in the city -- the Poles, Irish and Italians -- the political and financial activities of the Germans were not limited to their own ethnic group. Germans owned the largest breweries and the largest department stores. German doctors and lawyers were among the most successful in the city. German politicians, like Mayor Conrad Diehl (portrait above), a former county medical examiner, determined the outcome of municipal elections, while certain German families, like the Urbans, were among the wealthiest and most powerful people in the whole community. The Schoellkopfs: None were more influential than the Schoellkopf family. The founder of this prolific dynasty was Jacob Schoellkopf (photo above), who came to Buffalo in 1843 with the first wave of German migration to the city. Taking advantage of the city's location at the junction of the nation's most important commercial lines, Schoellkopf went into leather and grain, and by the end of the Civil War his tanning and flour mills were among the largest in the country. Schoellkopf was one of the first people to realize the potential of the waterpower generated by Niagara Falls, and during the 1870s he founded the first power company in the area. His two sons, Jacob, Jr. and Hugo, further developed the power company while opening a chemical company that by the turn of the century was the largest manufacturer of aniline, a chemical used in the manufacture of explosives. By the end of the century, the Schoellkopfs had become one of the wealthiest and most prominent German families in the United States.